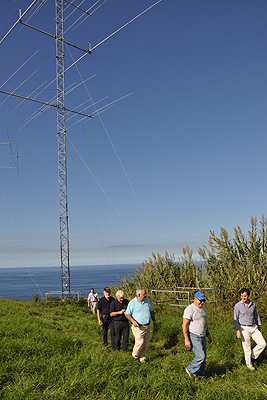 Several of the Azores Nine-Islands Hunt operators made a visit to the CR2X contest station in Ribeira Grande on the north coast of São Miguel island, as well as to the QTH of José CU2CE who lives close by. 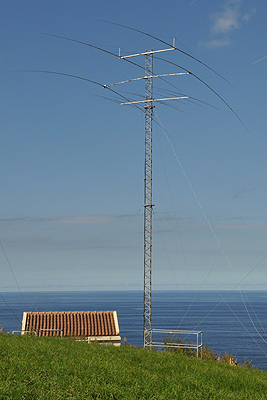 CR2X is part of the Arcala Extremes radio network. The tower fixed on Europe at CR2X. There are three towers, two fixed and one rotating. 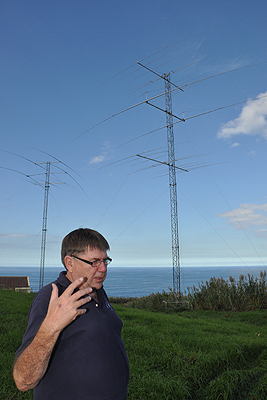 Martti OH2BH explains the concepts behind the CR2X contesting station on the Azores. 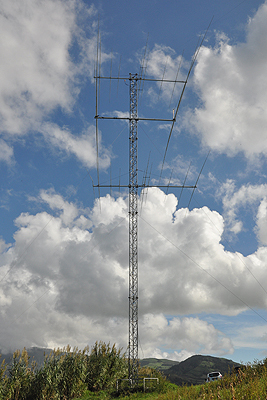 Rotating multiband tower at CR2X includes a 2-el Create beam for 80m. 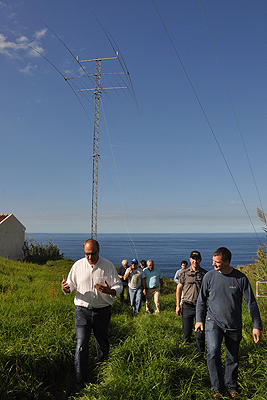 Yuri VE3DZ, Richard DF9TF, Franz DJ9ZB, Jorge, José CU2CE, Francisco CU2DX with the "Europe" tower at CR2X. 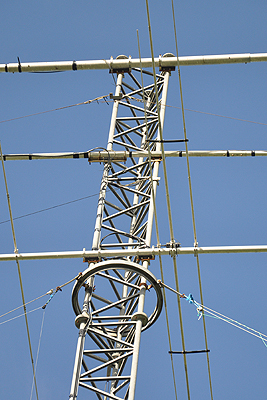 Close up of the top of the rotating tower at CR2X. There are also two fixed towers, one for Europe and one for the USA. Juha OH8NC leads a group of visitors at the CR2X contest station. There is an excellent sea take-off to the north for EU and USA. 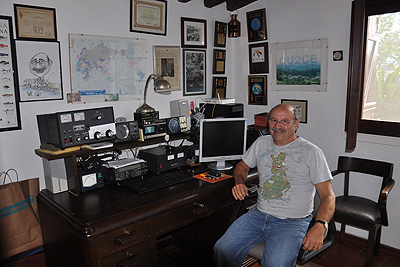 José CU2CE in his shack. 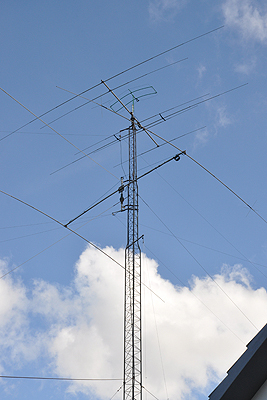 José's QTH is within sight of the huge antenna farm at the Azores Contesting super-station CR2X. 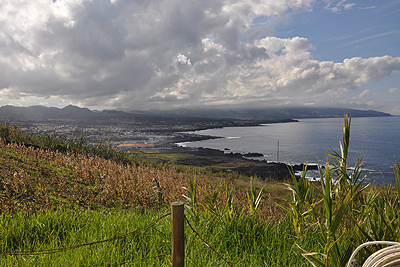 The view towards the west of the island of São Miguel from the CR2X contest station. 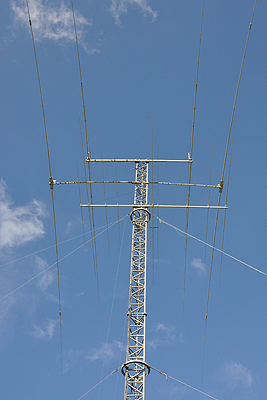 The antenna tower at José CU2CE's QTH includes a Cushcraft "shorty-forty". 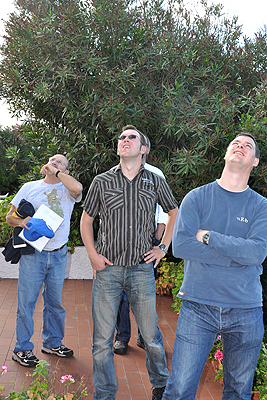 José CU2CE, DARC Editor Alex DH9AS and Michael G7VJR looking up at aluminium. The centre tower at CR2X with the purpose built station and the 100m drop into the sea. 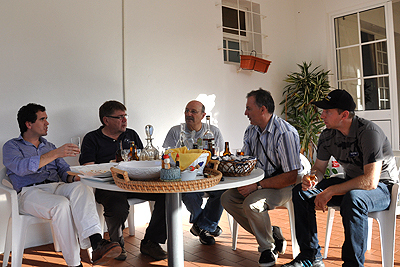 Francisco CU2DX, Martti OH2BH, José CU2CE, Yuri VE3DZ and Ed VE3FWA enjoying a drink at José CU2CE's QTH. 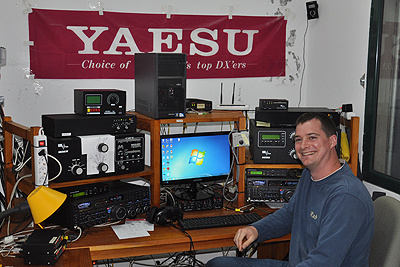 Michael G7VJR poses at the operating position of the Azorean contesting super-station CR2X.